Each year millions of monarch butterflies call Cape May, NJ home for a few days, as part of their 2,000-mile migration from Canada to Mexico. Eco-tourists won't want to miss this. Each year from September 1 through October, Cape May, New Jersey wildlife biologists play an important role in understanding the migratory patterns of Monarch butterflies. They also monitor the size and health of the Monarch butterfly community. Since 1992, a formal daily census of monarch butterflies has been conducted in Cape May, the longest of any locale. Environmentalists are increasingly concerned that the use of fertilizers and pesticides combined with the loss of Monarch butterfly habitat areas is threatening the health of this butterfly species. In addition to observing and counting the Monarch butterfly, the wildlife biologists also tag them. When I first read that Monarch butterflies were being tagged, I could not imagine how. The photo to the right shows the small adhesive tag that is very carefully affixed to the Monarch butterfly's lead wing. It causes no damage to the wing and does not in any way affect the ability of the Monarch butterfly to fly. It's also a very low-tech tag that does not contain a computer chip to report the butterfly's location. So the wildlife biologists rely on butterfly watchers up and down the east coast of the United States to report back whenever they find a tagged butterfly. So keep your eyes open when your enjoying your butterfly garden! The results are both fascinating and amazing. A Monarch butterfly was tagged in Cape May and the next day was reported seen the next day 140 miles away on Fisherman Island in the mouth of the Chesapeake Bay. 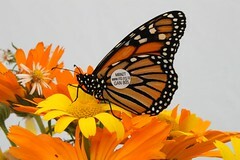 Adopt a Monarch butterfly for $25. Of course the proceeds go toward the Monarch Monitoring Project. You'll be emailed, if your butterfly is seen along the route. A truly fun gift to give a child or avid naturalist. These tagging efforts have played an important role in understanding the Monarch butterfly migration route. In 1994, a Monarch butterfly tagged at Cape May was found in Temple, Texas. This supported but did not prove the Mexican migration theory. In 1998, Cape May wildlife experts tagged an astounding 10,000 Monarch butterflies. Their efforts were rewarded when 7 of their tagged butterflies arrived in El Rosario, Mexico. How do You Count Millions of Monarch Butterflies? Three times a day, every day, from September 1 to October 31 a single observer drives a 5-mile route at a speed of 20 to 25 miles per hour. The observer includes every Monarch butterfly seen, but no stop is made to count specific concentrations. The route is designed to travel through a variety habitats including southern hardwood forest, agricultural field, brackish wetland meadow, suburban neighborhoods, and coastal dunes. The Cape May Point State Park is one of the best places in the United States to see the Monarch butterfly migration in full swing. This is a great place for them to rest up and add to their body fat (you really don't think about a butterfly having body fat). Then they have to fly across 13 miles to Delaware. Quite a feat when you way less than a paper clip. But there's lots more to do at the Cap May Point State Park. From September through mid-November this is a great place to watch migratory hawks. A special viewing platform has been built and there's usually an official hawk watcher from the Cape May Bird Observatory there. You can also check out the Cape May Point Lighthouse. For a small fee you can climb to the top for a wonderful view of the park and coast. There's also a large number of trails that you can walk through to see the parks wildlife up close. Restrooms are available in the Headquarters Building, but there are no food concessions. So pack a lunch and something to drink, if you plan on spending the day. The parking lots are open from sunrise to sunset and can hold several hundreds of cars. There is a beach there and it is free. Milkweed is the only plant that the Monarch butterfly female will lay her eggs on. So it is crucial to the survival of the species. If you only do one thing, please include milkweed in somewhere in your garden. You don't need to have a designated Monarch butterfly garden in your yard. Your reward will be to have the most beautiful visitors. If you live on the East Coast, perhaps you'll find a tagged Monarch butterfly that you can report. Enjoy this Monarch Butterfly Garden! That's so cool Katie! Your daughters went to a wonderful school to come up with that project. At my elementary school, all we did was color pictures of butterflies. My daughters raised, tagged and followed the migration pattern of the Monarch butterfly to Mexico at their world cultures and foreign language school. The kids love raising, tagging and releasing the butterflies into the wild. Its an exciting event each year. A great topic to cover! You're welcome Sheila. Yes. Monarch butterflies are truly marvels. I love these beautiful butterflies and am awed by their migration! Thanks for this wonderful article!